2017-18 Teacher Policy Fellowship Application Open! 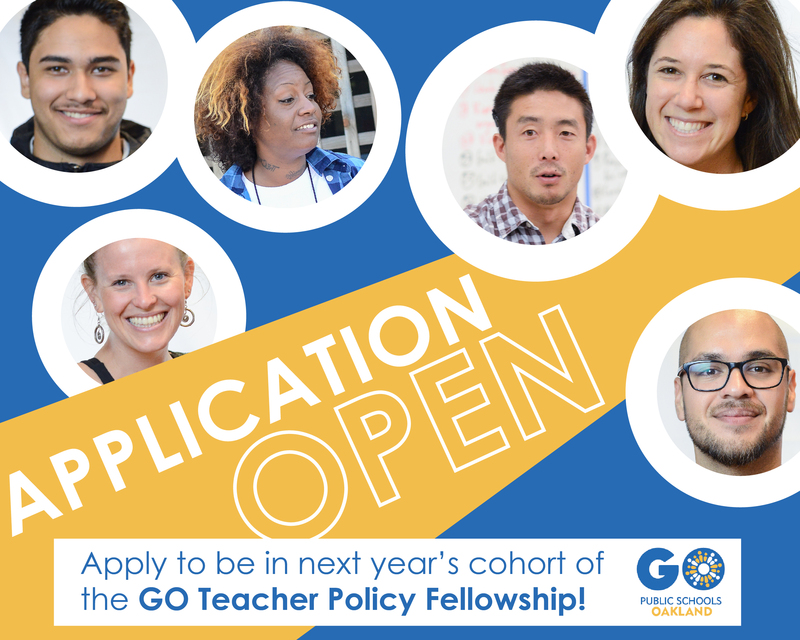 The application to be a part of the next cohort of GO Teacher Policy Fellows is now live – click here to apply! To inquire more about the process, please contact our Manager of Educator Community, Angela Badami-Knight, at angela@gopublicschools.org. As I learned 4 years ago, the GO Teacher Policy Fellowship can help you answer these questions and support you in taking action on the issues that are important to you and your students. Click here to RSVP for the Teacher Policy Fellow Info Dinner on Tuesday, March 28, from 5-7pm. We’ll go into more detail about the scope and sequence of the Fellowship and get a chance to answer any questions you may have. Learn: about the education landscape in Oakland, what policies are made at the district-, state-, and national- level, and who influences Oakland education policy. Listen: to other educators about the issues affecting them and their students. Think: with your cohort to synthesize what you’ve heard, look for trends to focus your research, and consider best practices in order to write policy that can help solve the problem for Oakland. Lead: organize fellow educators to advocate for policy change using a framework informed by the PICO organizing model. As we reflect on history, it becomes apparent that significant change takes time and continued advocacy. There is much that one needs to learn before they can jump into action in Oakland. This is why the GO Teacher Policy Fellowship is now a 2 year opportunity. Year 1 of the Fellowship will have an emphasis on understanding education policy making in Oakland-what has come before us, who are the changemakers, what are the major issues facing our city right now? Fellows will receive a $1500 stipend for participation in the first year of the fellowship. Year 2 will have an emphasis on creating a policy advocacy project and using community organizing techniques to reach a common goal. Fellows will receive a $2000 stipend for participation in the second year of the fellowship. Through both years of the Fellowship, we will meet twice a month for two hour sessions, and dedicate time in between sessions to readings, research, or actions towards the advocacy project. RSVP for the Fellowship Info Dinner on Tuesday, March 28 by clicking here. Click here to apply! We will be accepting applications until Wednesday, April 12th. Know an Oakland teacher who might be a good fit? Nominate a Fellow and we’ll reach out and invite them to apply!